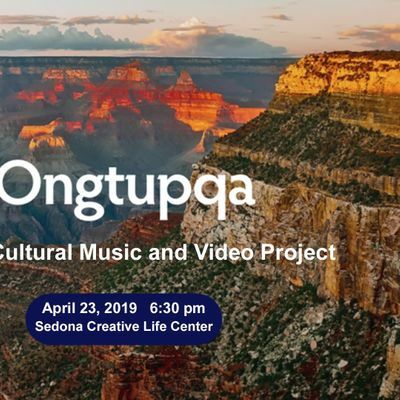 ALL PROCEEDS FROM THIS CONCERT GOES TO SUPPORT THE ONGTUPQA PROJECT TO BRING THE ANCIENT HOPI FLUTE BACK TO HOPI, INCLUDING LESSONS FOR HOPI YOUTH. "MY ONLY HOPE IS THE MUSIC AND SONGS WE OFFER WILL RESONATE WITH THE WORLD. AS HOPI WE WERE BORN FROM THE SIPAPUNI' WITHIN GRAND CANYON, AND WHEN WE ARE DONE WE RETURN BACK TO THE WOMB OF OUR MOTHER TO REJUVENATE LIFE OF A NEW BEGINNING. THIS IS THE CYCLE. THIS IS THE HOPI WAY. AND THESE ARE SONGS ABOUT THAT SPECIAL PLACE - ONGTUPQA." -- CLARK TENAKHONGVA, Hopi Vice Chairman. Clark Tenakhongva, narrator in the video, was born in Keams Canyon in 1957 and was raised in the Third Mesa village of Hotevilla. His father is of the Corn and Water clans. His mother is of the Rabbit and Tobacco clans. He is a respected traditional cultural practitioner and has a lifetime of experience singing Hopi songs. Clark has been invited to sing on stages around the world, has four recordings on Canyon Records and has won numerous awards for both his music and katsina carvings. Stewart Koyiyumptewa is the Director of the Hopi Cultural Preservation Office in Kykotsmovi, AZ. Stewart will begin the program with a discussion of the cultural importance of the Grand Canyon to the Hopi. 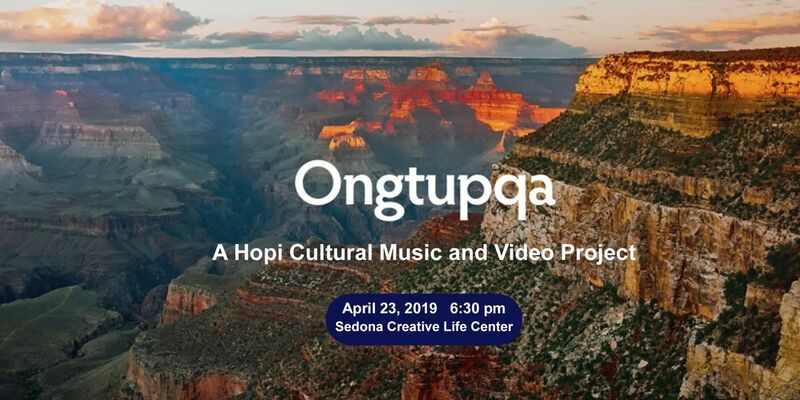 He will also describe the cultural connection to the Hopi flute that will be part of the evening concert. Gary Stroutsos is a master flute player whose contemplative music and time-honored stories evoke the lands and cultures that he has studied over his 35-year career. Gary’s talents flow through a variety of world flutes, but his mastery of the Hopi long flute transports listeners to a spirit of place unlike any other. His music can be heard on the soundtrack of Ken Burns’ PBS documentary, Lewis and Clark: Journey of the Corps of Discovery, which led to a command performance at the White House for President Bill Clinton. Matthew Nelson is an ethnomusicologist and host of Global Rhythm Radio on KXCI-FM who has studied a variety of drumming traditions with master musicians, including tabla (melodic drums of North India) with Pandit Sharda Sahai of the Benares gharana of tabla. While working as an archaeologist, Matthew became interested in the ceramic tradition of the Southwest, and combined with his love for indigenous music began an exploration of clay pot percussion. He also served as the Tribal Historic Preservation Officer and NAGPRA Consultant for the Bishop Paiute Tribe in the Owens Valley of California where he grew up. Jeffery Koyiyumptewa is a Hopi student and music student of Hopi traditional music and instruments.